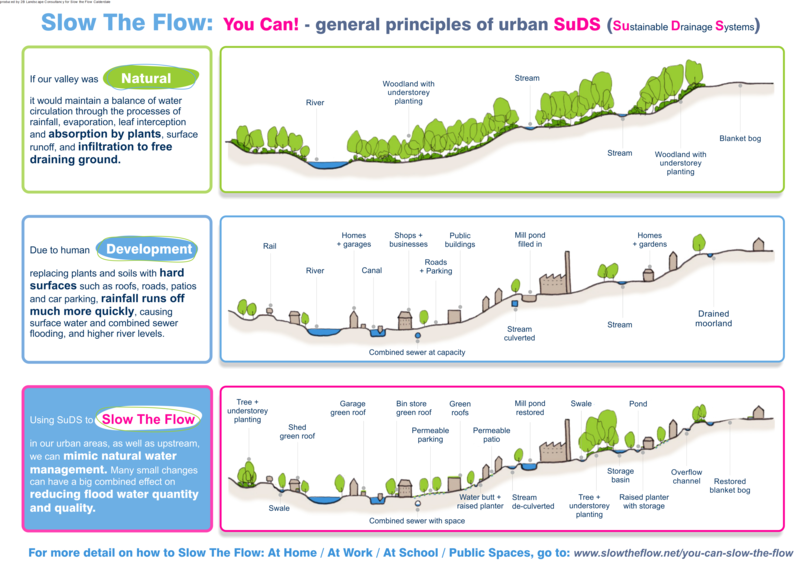 Sustainable Drainage Systems (SuDS) are a practical and effective means of reducing flood risk. SuDS philosophy is to hold rainwater back at source, where it can either soak safely into the ground or alternatively be released slowly into a receiving watercourse at a controlled rate. This combination of reducing the volume and slowing the flow of water through catchments allows sewers and waterways to cope with increased rainfall during storm events. This means that waterways are less likely to overflow and create floods when it rains heavily. Marshalls are experts at managing water within hard landscapes. Using a combination of permeable paving, channel drainage, CK&D (combined kerb and drainage) and pre-cast pipes we can design systems which intercept, attenuate and slowly release large volumes of surface water runoff. Our water management product range integrates seamlessly into urban surroundings balancing aesthetic requirements with excellent hydraulic performance. However, hard SuDS are only a part of the overall solution. Before surface water even reaches urban conurbations, soft SuDS features such as attenuation ponds, swales and reed beds are simple ways of carving up a landscape to direct, attenuate and slow the flow of water across open space. These have the additional benefit of adding multi-functional amenity and biodiversity benefits to an area; lush green spaces that improve air quality, reduce noise pollution and attract wildlife - quite apart from simply being pleasant spaces to spend time in. This process of using natural landscapes and materials to slow the flow of runoff is referred to as Natural Flood Management (or NFM). There are many NFM techniques and practises that can be adopted on any scale from large valley-side farmland excavations to back garden alterations, all of which will have the effect of holding back rainwater in a storm event. Most require little in the way of engineering knowledge or technical skill to create; as long as SuDS principles are understood the alterations are usually very simple. Large scale projects include “leaky dams”, using logs and branches to dam up rivers and slow flow rates, or river re-routing, which adds curves and bends to straight rivers, again slowing the flow rate. Measures that can be undertaken at home include raingardens, which can be as simple as indentations in a lawn that can attenuate water in a storm event, or soakaways adjacent to paved areas, which store surface water until it can infiltrate into the ground. Understanding the full water management hierarchy from NFM, soft SuDS and permeable surfaces through to underground pipes is a vital aspect of mitigating flood risk. No one solution can have enough impact to stop flooding alone – it’s only by using the combination of all the tools available to us (and in the right order) that we can make a difference. This means that collaboration is essential. Local authorities, water companies and DEFRA will all have a significant part to play but engineers, designers and manufacturers need to engage with the issues too. Increasingly, affected communities are organising highly effective responses at a grass roots level. Bringing all of these stakeholders together with a common goal is our best chance of alleviating the flooding crisis. Slow the Flow Calderdale (STFC) is a multi-award winning group of volunteer engineers and water professionals who are committed to mitigating flood risk in the Calder valley. They manage multiple projects but their core activity is to use NFM techniques on the side of the upper Calder valley – initially around the Hardcastle Craggs National Trust property – to hold back the water that flows from the hill tops down into the towns at the foot of the valley. To help us better understand our role in the water management hierarchy, this July the entire Marshalls marketing team will spend 2 days on site with STFC using NFM techniques to reduce the volume of surface water that would otherwise flow down into Hebden Bridge. The town has suffered a series of devastating flood events over the past decade so this work will have a real impact on the town’s resilience, making life better for our colleagues and friends in the local community.